Washington Mayor Muriel Bowser speaks after taking the oath of office at the District of Columbia Mayoral Inauguration ceremony at the Convention Center in Washington, Friday, Jan. 2, 2015. District of Columbia officials are proposing additional training requirements for licensed security guards in the city, in part to help them respond to active-shooter situations. 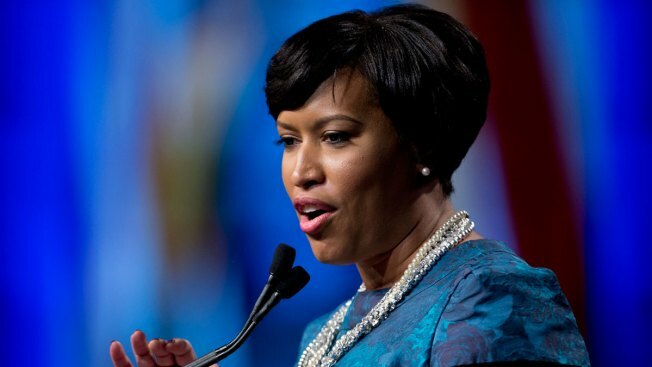 Mayor Muriel Bowser said Thursday that the new regulations were prompted in part by two cases in which men died in the custody of security guards. Two special police officers at MedStar Washington Hospital Center have pleaded not guilty to involuntary manslaughter in the death of a patient last year. An idictment says James McBride had a "fatal encounter" with 30-year-old Clifton Montgomery and 43-year Charles Brown after he left the hospital without a formal discharge on Sept. 29. McBride died two days later from blunt force injuries to the neck, including damage to his spinal cord, the medical examiner's office said. Also last year, Alonzo Smith,a special education teacher, died after being taken into custody by security guards at an apartment building. Bowser and Police Chief Cathy Lanier say the city's 17,000 security guards play a crucial role in public safety and the new training will allow them to do their jobs better.